If McDonald’s were a country, it would be the 92nd biggest country in the world and its GDP would be 20 million higher than that of Latvia. How can you relate a piece of Big Mac and the global economy? In 1986, The Economist invented the Big Mac Index (BMI, not to be confused with Body Mass Index) as a lighthearted way to compare exchange rates between countries relative to the price of a Big Mac. The index is based on purchasing power parity (PPP) theory to determine whether a currency is undervalued or overvalued. Big Mac and the global economy: how much does a burger cost in China? Over the years, the Big Mac index has somehow become a global standard to measure purchasing power between two currencies. Here is how the price of a Big Mac varies in different countries. The chart shows that burgers are generally more expensive in Europe and cheaper in Asia in 2013. Purchasing power parity (abbreviated henceforth as PPP) basically estimates how much exchange rate adjustment is needed so that an identical baskets of tradable goods in two different markets has the same price when expressed in the same currency. In this case, our basket contains only one thing: Mc Donald’s signature beef patties served in a three-part sesame seed bun, the Big Mac. So, in simpler terms, PPP estimates how much money would be needed to buy the same amount of goods in two different countries. For example, the average price of a Big Mac in the US was $4.56 in July 2013, and it was only $2.61 in China. Hence, according to the Big Mac index, Chinese Yuan was undervalued by 43% in July 2013. This also means that generally, countries where the Big Mac is cheaper has the ability to export their goods and services for lower prices as their currencies are undervalued. In contrast, currencies are generally overvalued in countries which sell more expensive Big Macs, so their products are more expensive. From this, we can derive which countries would be a hard sell. For example, since the index is based on the USD, European countries such as Norway, Sweden, and Switzerland which have overvalued currencies, would be an attractive target for US exports. Export oriented countries such as China and India have undervalued currencies compared to the USD, so US-made products would not be very attractive in Chinese and Indian stores given their prices. 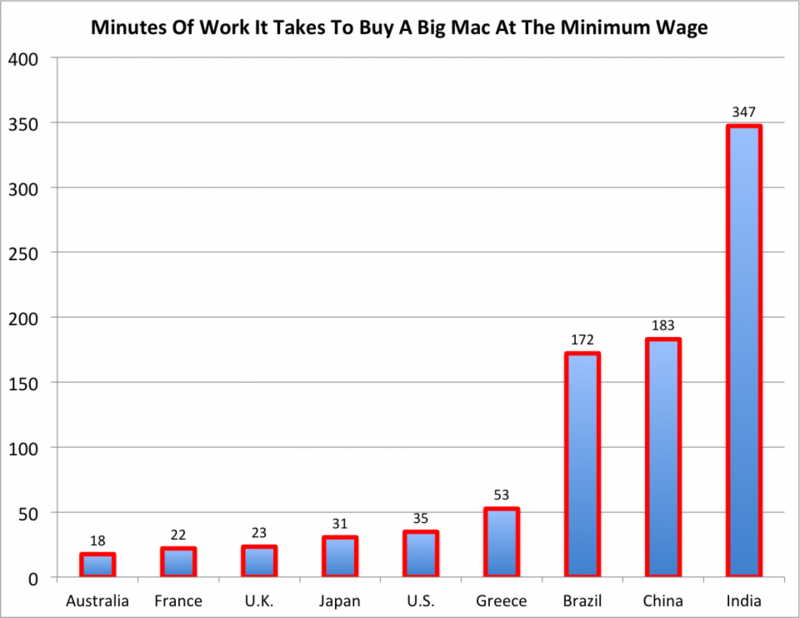 How many minutes of work does it takes to buy a Big Mac at a minimum wage? An interesting article on Business Insider uses the Big Mac index to measure how the US minimum wage ranks globally. The graph below shows that it takes approximately 35 minutes of work to buy a Big Mac lunch in the US, compared to just 18 minutes in Australia and a long 5 hours and 47 minutes in India. Food for thought: how many Big Macs can you buy with $1? 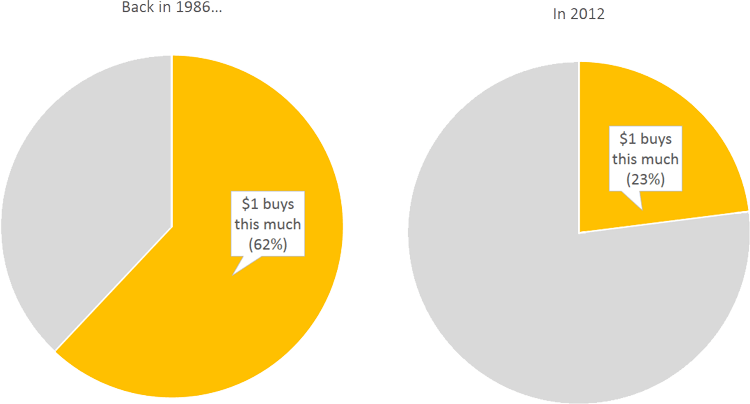 The cost to buy a Big Mac increased from $1.60 in 1986 to $4.56 in 2012 in the US (that’s a 185% inrease!). You could buy more than half of a Big Mac with $1 in 1986, but you would have to share with at least three other friends if you want to have a Big Mac lunch for $1. What does this say about inflation? Inflation is unavoidable and many suspect that governments are cooking the figures for many reasons, and they are understating the true inflation rate. The graph compares the difference between the Big Mac index minus the official inflation rate in different countries. For example, the difference between the Big Mac inflation and the official inflation rate in Argentina is approximately 9 percentage points. Does this proof that governments are understating inflation rates? Well, not really, as burger prices are expected to rise faster because food prices rise faster relative to other prices in various countries, although there is a notable difference in Argentina’s Big Mac index and its inflation rate. However, there are a lot of other things to consider before claiming that the governments are cooking the books, but one does derive an awful lot of insight from a burger. 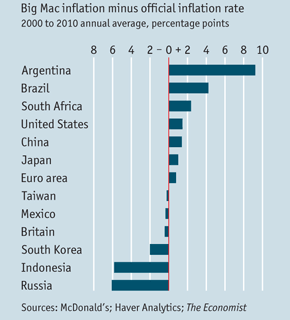 Big Mac and the global economy: how useful is this index? Certainly, there are a lot of other similar indicators popping up over the years, such as the Starbucks index and the iPod index, and they all have the same issue: there are too many things to consider. As fun and lighthearted as it is, when you try to connect a piece of Big Mac and global economy, there are a lot of limits. First of all, a Big Mac only consists of raw ingredients as variables, and these ingredients might or might not be grown in the country in which the burger is sold. Add in labor costs, shipping costs, and other variable costs – you get varied Big Mac prices across the globe. The Big Mac index might not be an accurate benchmark to measure global economy, but it can be a good indicator of patterns such as how a currency is appreciating or depreciating over the years. Even The Economist stated that this index is a “fun” index which was never meant to be an accurate measure of currency exchange rates. One can derive an awful lot of insight from a burger.